I ate eight bananas in three days. That’s not a problem, right? Hope not! 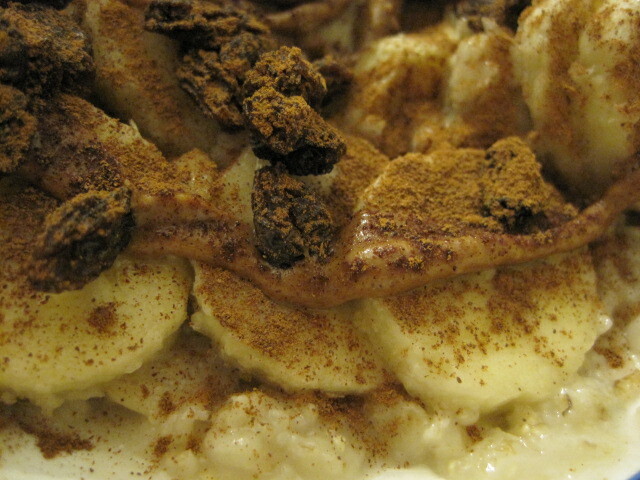 Two bananas were sliced up for morning oatmeal bowls. 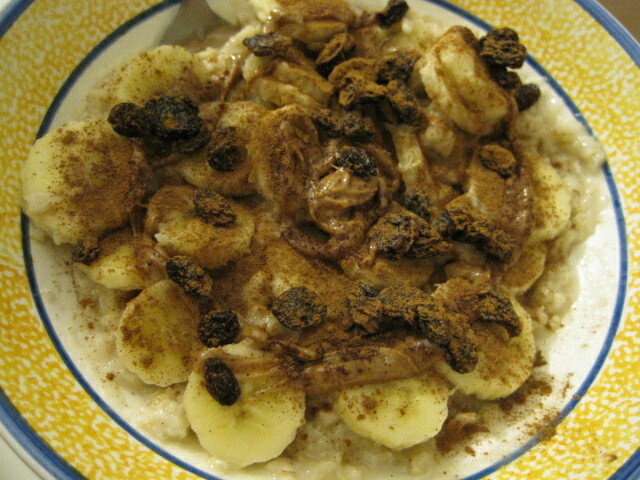 That’s cooked oats with 1 fresh banana, a driz of almond butter, cinnamon, and some raisins. 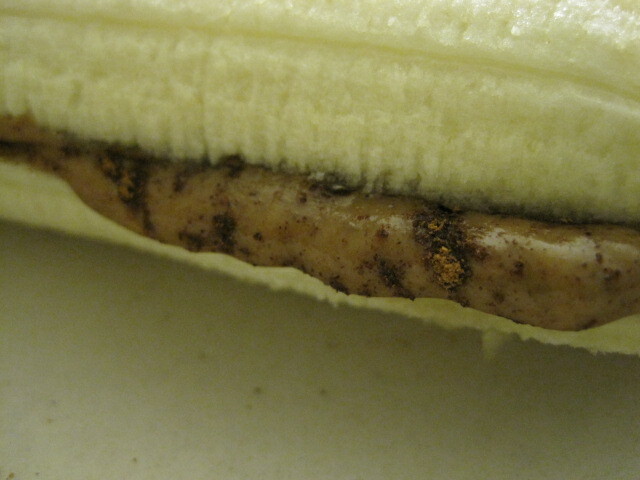 One banana was used to make a banana sammie. 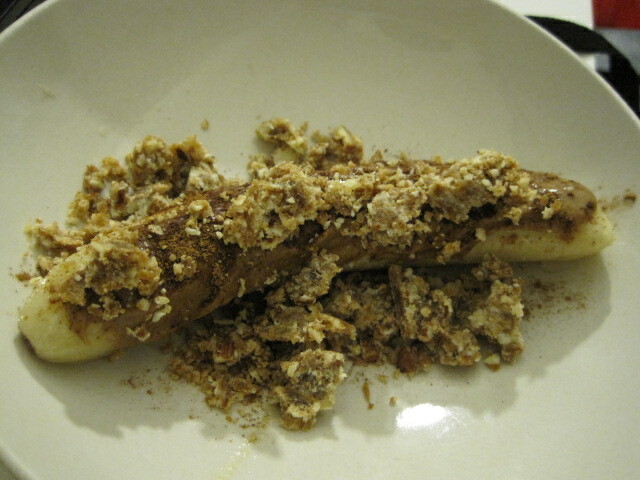 Just a fresh banana sliced lengthwise, oozing with almond butter and cinnamon. MmmMMmmm. 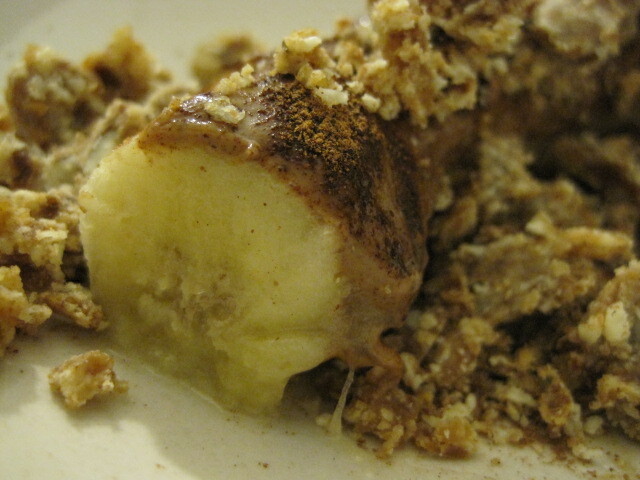 Two bananas were used for frozen banana crumbles. 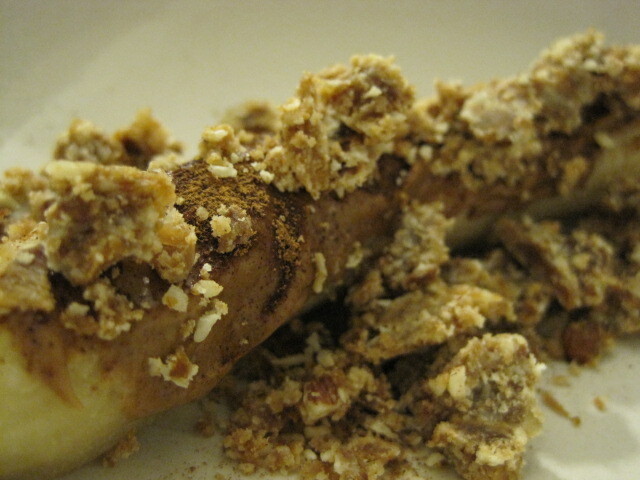 I took a frozen banana and slathered it with some almond butter and cinnamon, softened it a bit in the micro for 20 seconds, and then crumbled 1/2 a semi-frozen Larabar on top. Yes, I know what you’re thinking… I basically ate the same thing in three variations. 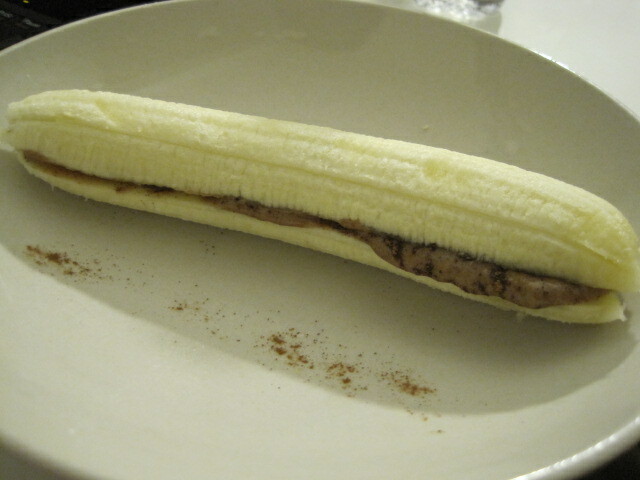 Haha well, what can I say… banana + almond butter + cinnamon is versatile. It’s also a godsend when I’m in my sister’s drab apartment. The other three bananas were frozen and eaten plain like popsicles. That’s my favorite way of eating them! Wrap in a paper towel and nibble nibble. Zero fuss. 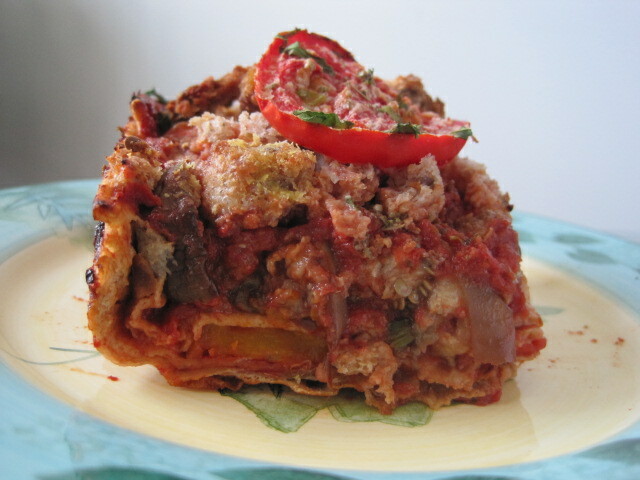 Monday’s dinner was an odd one. 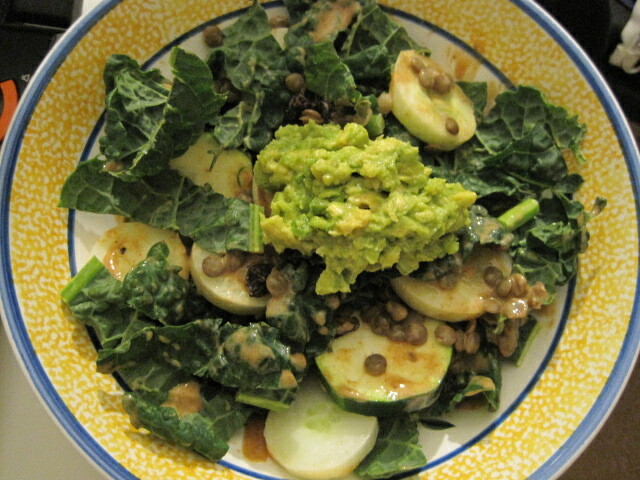 Dinosaur kale, cucumber, zucchini, lentils, and raisins, tossed in a dressing made from some almond butter, hot sauce, and a drop of olive oil, and topped with a big dollop of avocado. Sounds crazy but it was great! 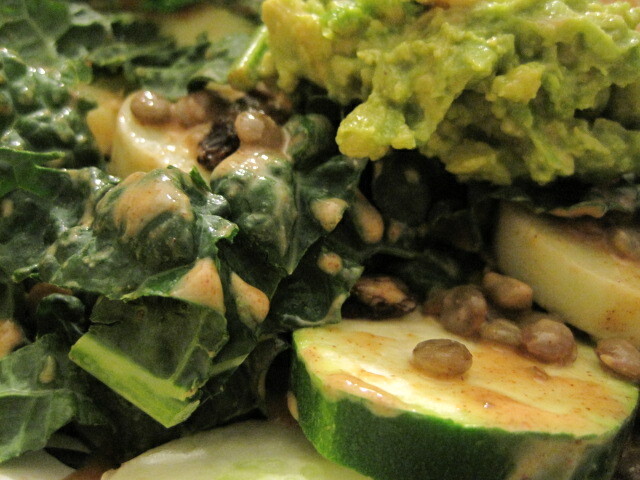 The dressing tasted like spicy peanut sauce. 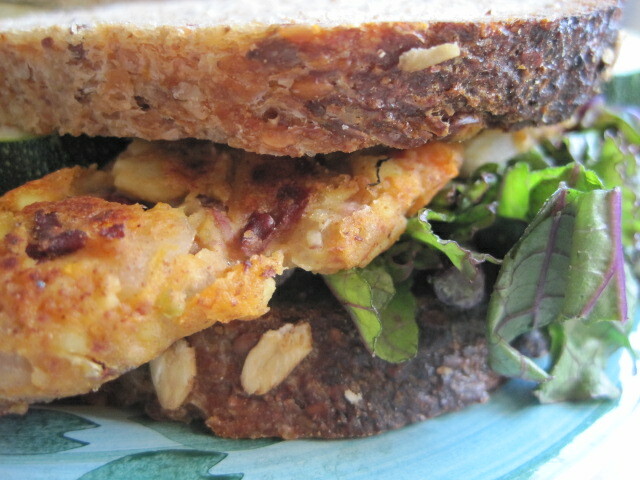 Naturally it tasted great with the raisins! 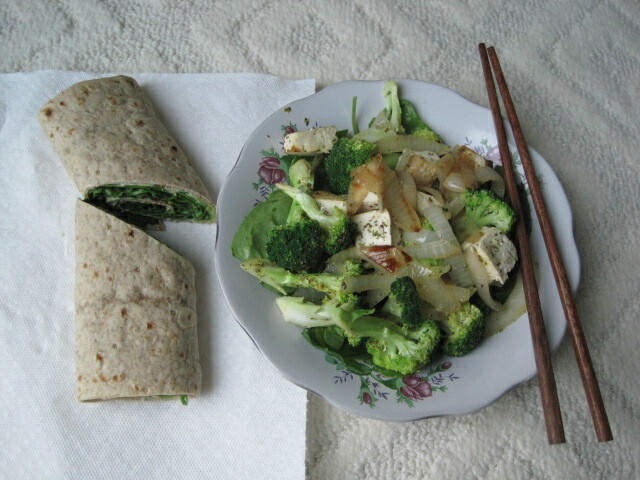 Last night, back at home, I had a spinach wrap with a quick tofu veggie stir-fry. 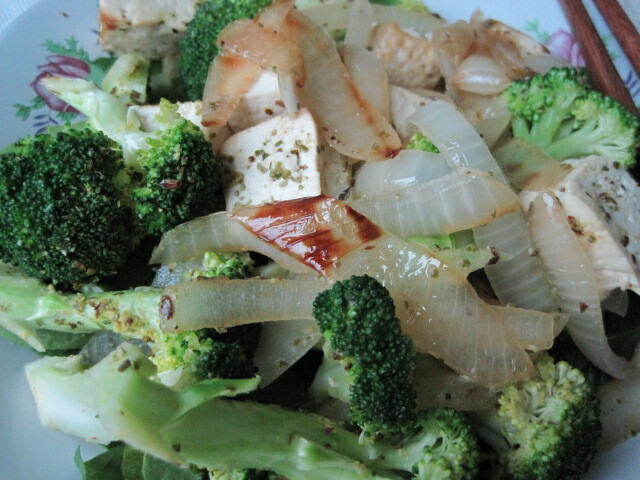 Into the stir-fry went EVOO, onion, broccoli, firm tofu, sea salt, kelp & cayenne seasoning, dried herbs, ground flax, and nutritional yeast. I had some spinach that wouldn’t fit into the wrap, so that became the bed for the stir-fry. 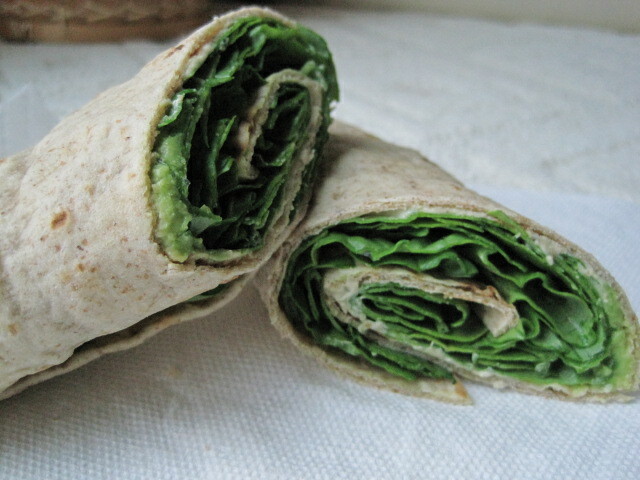 Whole wheat wrap with hummus, mashed avocado, and baby spinach. Post-run this morning, I had a cup of Green Titanic. 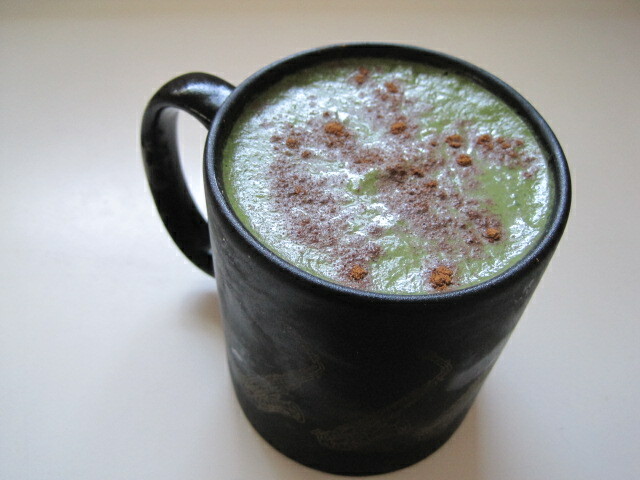 Okay, it was more like a normal green smoothie since it didn’t sit in the freezer very long today. I don’t mind them nice and thick though! By the way, that’s the mug I got from my piano teacher 8-10 years ago. Don’t ask why it’s adorned with saxophones! 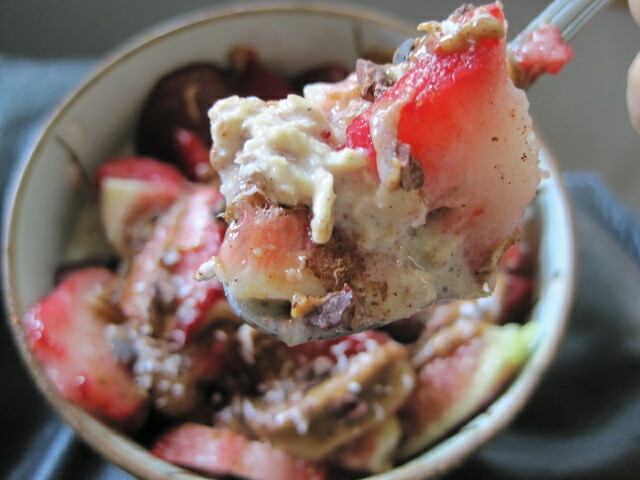 A while later, I dug into some fig-strawberry overnight oats. I need to eat the figs quickly before they go bad! They are such a delicate fruit, so any and all bruises make them more susceptible to mold (eek!). In fact, one fig had a tiny rotten spot, but I just scooped that bit off and carried on. 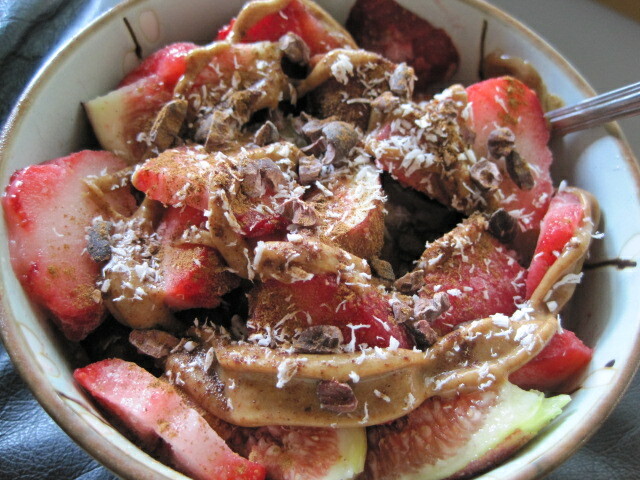 3 fresh figs, 2 semi-frozen strawberries, almond buttah, unsweetened shredded coconut, cacao nibs. Oh, but of course. This is probably my third time eating this, and you know I’ll be eating it again tomorrow! 1. What’s your favorite banana dessert? As you all know, I love eating frozen banana straight up. I haven’t made banana bread yet, but I have been eyeing this recipe for the longest time! 2. 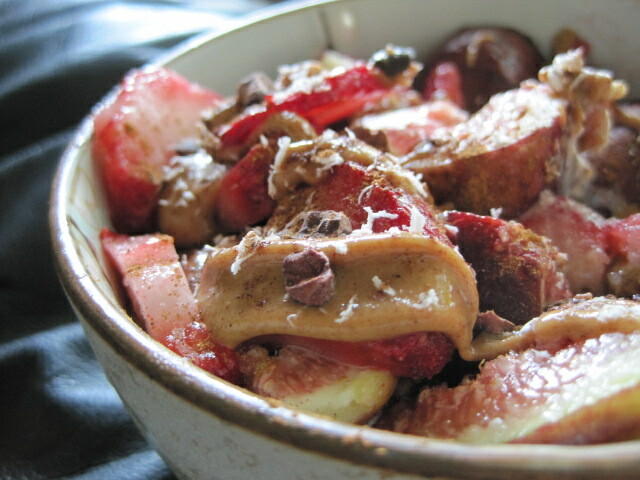 Favorite way to eat figs? 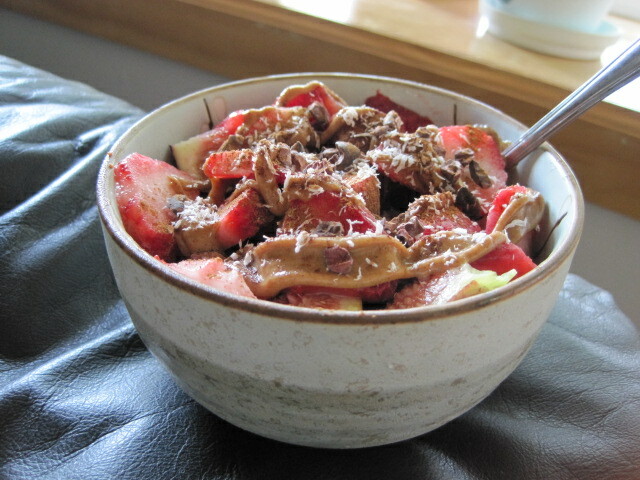 I love it with almond butter and cinnamon. Heck, I love everything with AB and cinnamon haha. 3. What do you do when part of a fruit or veggie is rotten–cut that bit off and eat the rest, or throw the whole thing away? I really hate to waste, so if something is just starting to go “bad,” I usually pick the icky part(s) off and pretend that it’s good as new. If it’s obviously unsafe to eat, then I’ll chuck it. One thing I can’t stand the idea of putting into my mouth is moldy bread… once I see the blue/green, all of it goes to the trash! Now if you’ll excuse me, I have a date with my mathematical statistics book for the next few hours, with lunch some time in between. I finally got the book yesterday so today marks the start of my cram session for the first actuarial exam! I’ve been behind on my Reader–totally unheard of for me–so I apologize in advance for my absence!